is the first freedom because if we are not free in our conscience and our practice of religion, all other freedoms are fragile. If citizens are not free in their own consciences, how can they be free in relation to others, or to the state? If our obligations and duties to God are impeded, or even worse, contradicted by the government, then we can no longer claim to be a land of the free, and a beacon of hope for the world. religious liberty, followed by an educational program in Sweeney Hall, presented by Frank Valenzuela of the St. Thomas More Society, Catholic Lawyers’ Guild of the Diocese of Dallas, and closing with the Litany for Liberty (USCCB). program in the Cafeteria presented by Aurora Tinajero, Diocesan Coordinator of the Congreso Hispano de las Americas para Respeto a la Vida y Evangelización, and closing with the Litany for Liberty (USCCB). 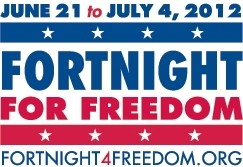 For more information on these and other “Fortnight” events in the Diocese of Dallas, visit www.dallascatholicadvocacy.org.